The other night, I again had the privilege of visiting Petrossian on Robertson – the caviar boutique that doubles as a dining hotspot with a clean and casual ambiance. I know the space well from my numerous visits to Chef Benjamin Bailly and have even had the honor of judging a cold soup Dine LA Quickfire ChallengeÂ (recap) held in the boutique area. But things have changed since the end of Chef Bailly’s year-long tenure as Executive Chef. He has moved on to Fraiche in Culver City and now, Giselle Wellman has taken over the kitchen. She has some big names on her resume, including New York’s Del Posto and most recently Beverly Hills’ Bouchon. Armed with just a basic pasta recipe by Tony DiSalvo, she taught herself how to make 20 kinds of pasta at his Jack’s La Jolla for the purposes of its reopening as an Italian restaurant – quite a feat that would be perfected by working in Mario Batali’s kitchen thereafter. 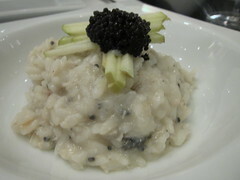 My second favorite dish of the evening was the Smoked Sturgeon Risotto with pressed caviarÂ cooked into the dish in order to fully integrate the eggs’ flavors. The topping of slicedÂ apple slices was an elegant, sweet reprieve from the rich risotto. Everything on the plate made for a really delicious combination while the risotto itself was amazingly complex in its richness. If I weren’t so full, I might have licked the plate. Of course, we had to have dessert and with a vendor like Petrossian and their delicious chocolates, it’d be premature to leave their dining room without having done so. Giselle was especially excited about her on-theme espresso pearls, which, of course, look like caviar. She showed us a video of her making them byÂ droppingÂ theÂ espressoÂ mixture into clear liquid with an eye-dropper. The result?Â A glorious topping to spread over panna cotta. The beads weren’t especially potent but they were indeed novel and well, espresso goes extremely well with vanilla. The cardamom shortbreads had good spice and were a nice, crunchy side note. 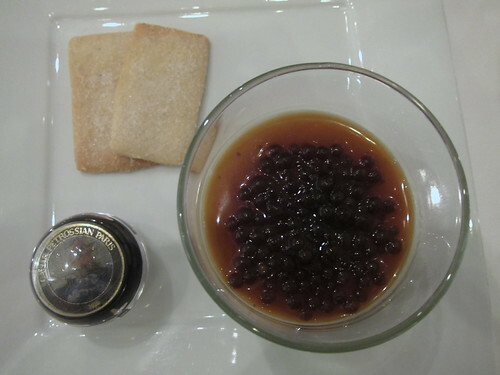 This is definitely my go-to dessert at Petrossian. Overall, I was impressed with Giselle’s new but solid menu – especially given that she just moved in a few weeks ago. It seems like she’s fitting in well into the space at Petrossian and will continue to evolve in that space, given her unbridled passion for cooking. I can’t wait to revisit to try more dishes, which she’ll have time to perfect. The blogger-friendly boutique-restaurant hybrid has great things to look forward to. Also, Petrossian is participating in Dine LA (going through Friday this week and Sunday – Friday, January 30 – February 4 next week). Fortunately, the risotto, agnolotti and espresso panna cotta I’ve mentioned are all on that menu so this is the opportune time to try them out. 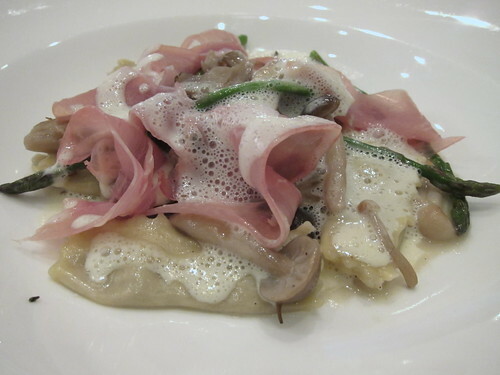 This entry was posted in Food, robertson, West Hollywood and tagged agnolotti, beverly blvd, boutique, caviar, chef, Dine LA, dining, Dinner, espresso, French, Giselle Wellman, Italian, panna cotta, Petrossian, restaurant, risotto, robertson blvd. Bookmark the permalink.